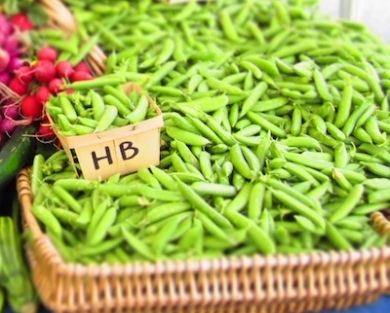 When Happy Boy snap peas start showing up at market, it means that spring is officially here. 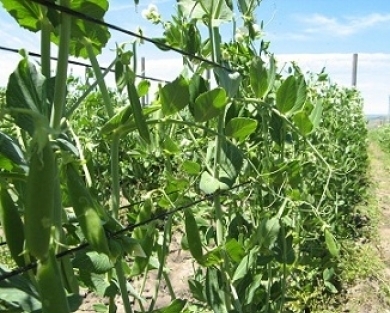 Since these sweet little peas - with an entirely edible pod - don't like the hot heat of midsummer, we harvest one crop in spring and try for another in the fall. Be sure to eat plenty early on because the second round is a gamble with the chance of an early frost. Satisfyingly crisp and sweet, sugar snap peas leave market for their new homes by the bagful. Many don't even make it that far though because they are delicious, and addictive, to gobble up whole. To prep for recipes like salads or stir fries, all you need to do is break off the little stem and peel back the string - their pod is just as edible and sweet as the peas inside. Light cooking is always best with these peas so they retain their bright color and snap - blanche or sauté them for a few minutes only. Refrigerate, unwashed, in a bag or container. 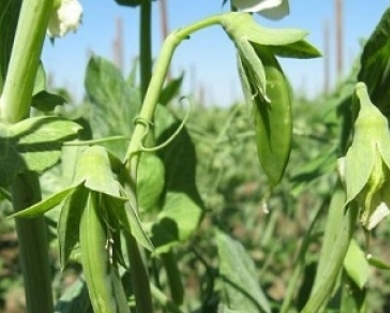 Flavor is best when sugar snaps are eaten within a few days of harvest. Sugar snap peas are an excellent source of iron, fiber, folate, and vitamins A, C and K.
Break off stems, peel back string and enjoy raw for an easy snack. Try dipping them in dressings, combining them with spring onions to add crunch and flavor to a baby mixed green salad or sautéing them quickly with olive oil, garlic, sesame oil and soy sauce.